Jacob writes: After a most successful vintage shopping trip in San Francisco, I found myself with a pair of exceptionally made Church brown oxfords. They’re in mostly good condition, but have some wrinkle and wear near the front, some scuffs here and there and some scratching near the back. Even in this condition, at $28, they’re wearable as a dressed down nice shoe, but I was wondering what my expectations can be to salvage them into an even better state. 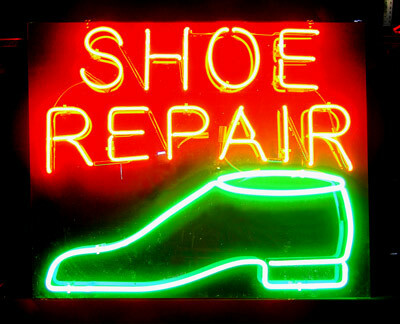 A cobbler can do all kinds of things to your footwear – replace your soles and heels, add protectors to your shoes and even stretch your shoes. On thing he can’t do is replace the panels of your shoes’ uppers. Creases will remain creased. Mild scratches and scuffs can be buffed and polished out to some extent, but deep scratches and scuffs are there for good. Stop by your local cobbler and ask what he can do. Some cobblers are better than others, and you might be surprised at what a good one can accomplish, but none have magic powers. Ask around for the best guy in your area, and stop by.